But even just having an R4 has to be a temptation. When all you have is a hammer, all the world starts to look like a nail - and when all you have is an R4, all the games start to look free. Nintendo may be gambling that by offering the functionality and convenience of flash carts right out of the box, it will discourage convenience-seekers from picking up the equivalent for the 3DS (and thereby getting tempted to download games for free). On the other hand, what about all of the people who (let's face it) just get flash carts because they want free games? These are the people who would rent games, or buy and return games, or trade games, or whatever - they'd install the game, keep it for free, and never look back. Honestly, Nintendo would probably still prefer that to the current state of things. Right now, all it needs is for one person to buy a copy of a game and put it on the internet, and thousands (if not hundreds of thousands) of people can download a pirated copy. Do you think game makers would prefer to have one legit copy shared between ten friends, or one legit copy shared by a hundred thousand people? By making it easier to get copies of games for free without ever venturing online, Nintendo might be hoping to reduce the overall impact of piracy on a per capita basis. If all of this is true, this could represent a huge turnaround in how one of the industry's major players deals with piracy - and honestly, it'd be a turn for the better. Rather than trying to futilely stomp out piracy with lawsuits and draconian DRM, Nintendo seems to be taking a "if you can't beat 'em ..." attitude. By offering Nintendo-sanctioned convenience and trying to address some of the root causes of why people buy flash carts in the first place, the 3DS' install functionality may be an attempt to curb piracy through the offering of a carrot, rather than the threat of a stick. Of course, these are all big "ifs." While the source that reported the new feature of the 3DS is a trustworthy one - Nikkei is one of the biggest Japanese newspapers, and (correctly) reported that Nintendo's newest handheld would have high-quality graphics months before its official reveal - it hasn't actually been confirmed by Nintendo yet. Even assuming it is real, we don't know what limitations (if any) will be on the functionality. Maybe cartridges can only be copied to any one 3DS at a time, similar to how any given Pokewalker only works with one copy of PokÃ©mon HeartGold/SoulSilver at a time. 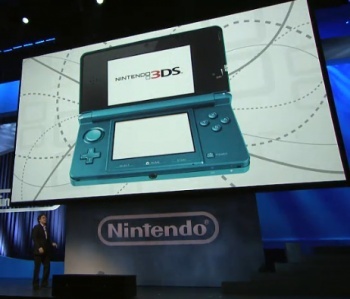 Maybe the 3DS only has enough memory for a handful of cartridges, meaning that you'll need to keep trading as new games come out. So, it's completely possible that when we learn more about the feature, this column will be completely invalidated. But until then, it's nice to think that maybe, just maybe, one of the major players in the industry is taking a different approach to dealing with piracy, don't you think? John Funk hates Greg Tito for getting to play the 3DS at E3. What a jerk.